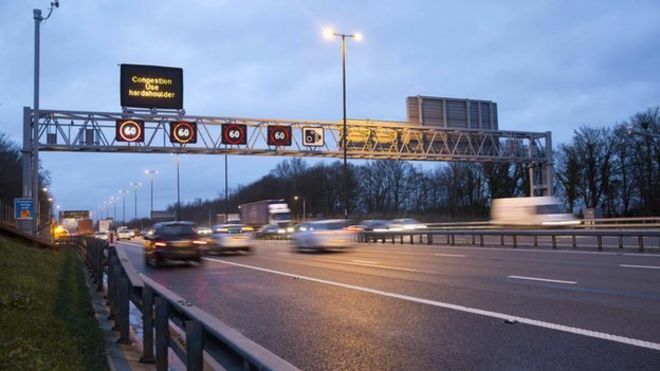 A survey conducted by the UK Institute of Advanced Motorists (IAM) on the introduction of smart motorways found 71% of drivers said they would feel less safe on a motorway with no hard shoulder than a motorway with one. A red cross without flashing beacons: The hard shoulder is only for use in an emergency or breakdown. A speed limit inside a red circle: It is absolutely mandatory and may have cameras enforcing it. A blank signal: Usual motorway rules apply. A white arrow with flashing beacons: This applies to all lanes and means you should move into the lane which the arrow points to. A red cross with flashing beacons: You should not continue to use the lane. A national speed limit sign is shown: The national speed limit, 70mph maximum, applies to all lanes apart from the hard shoulder. All-lane running – there is no hard shoulder on these sections of the motorway. Obey the variable speed limits and do not stop on the motorway. In the event of an emergency, use an emergency refuge area, motorway service area or exit at the next junction.